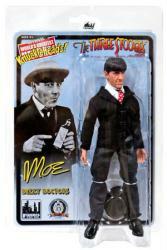 This is an approximately 8" retro-style action figure of Moe from The Three Stooges. This figure is of Curly in authentic cloth outfit as he appeared in the 1937 Three Stooges short film Dizzy Doctors. The figure was produced by Figures Toy Co. in 2014 and remains new and sealed in its original NEAR MINT clamshell packaging.